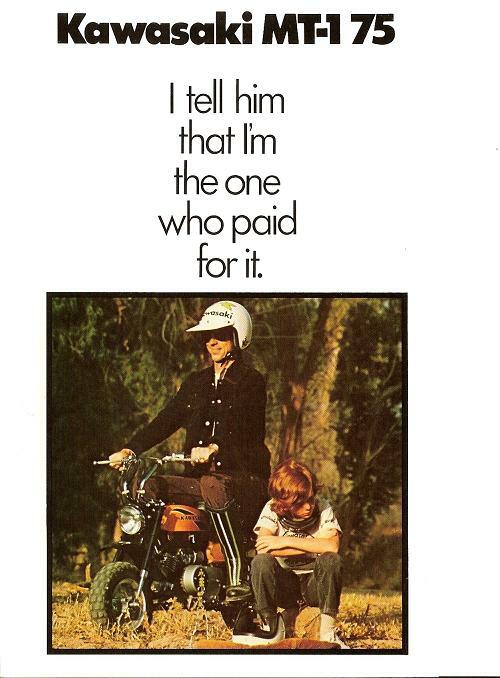 A later MT-1 advertisement in typical form from Kawasaki in the 70s. This bike precedes the Kawasaki KV75. I'd always fancied a monkey bike but rather than go for a Honda I had to be different so I bought this 1974 Kawasaki MT1B as a restoration project, as you can see it wasn't that bad to start with and a big bonus was that it ran, that's rare for my purchases. Stripping the bike down was no problem and quick due to the size of the components. Not much fancy stuff on this bike. Had to be careful here as this is a really compact unit and I could see someone else had been inside and to be honest it was quite a mess with seals fitted incorrectly and blocked lube holes with the over use of 'instant gasket'. Everything was put right and the centrifugal clutch stripped, re assembled and set correctly, also a genuine Kawasaki gasket kit from Vintage Kawasaki in Canada sorted many of the inherited problems as the engine went back together properly. The frame and it's associated bits were sent away for powder coating in satin black, on their return I was pleased with the result. As the tank had a few dings, scratches and such I decided to strip the paint, surprisingly this was quite difficult but I got there in the end. I filled the dings and gave it a few coats of primer filler followed by a good rub down. Then an undercoat followed by a few coats of Kawasaki racing green then a few coats of lacquer all using rattle cans. The tank transfers also came from Vintage Kawasaki as did 95% of the required parts and as I had photos to show their correct positioning it was a breeze. Thanks to Vintage Kawasaki. These engine covers were painted as above only in er... metallic silver. Finished Kawasaki MT1B, runs sweet, stops well and looks great. 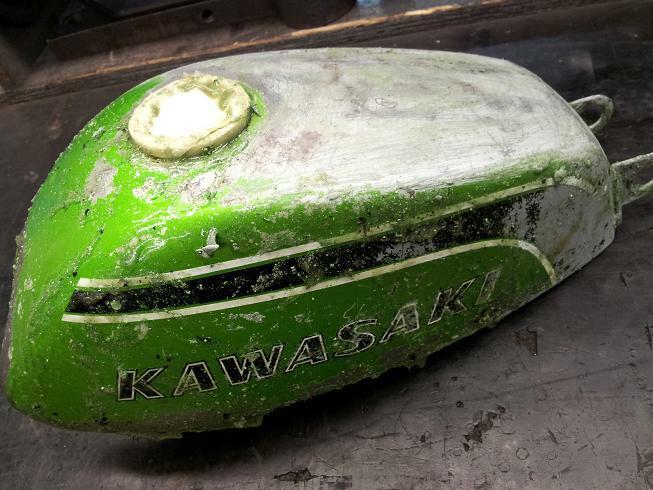 Not enough room on this page to cover the full restoration of this lovely Kawasaki MT1B but I've noted that if there is too much writing then readers soon loose interest and become bored and move on. Kawasaki MT1B sold summer of 2014.